Sarah and Becca Duncan said their father may not live until their weddings. 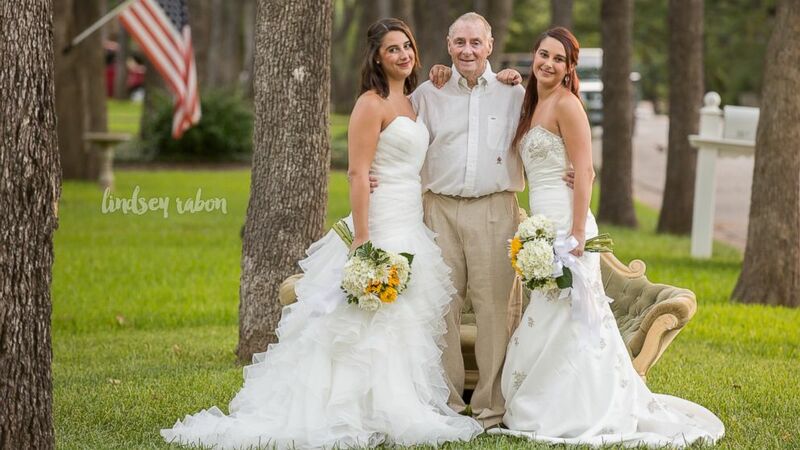 Twin sisters Sarah and Becca Duncan aren't engaged, but the two decided to take wedding photos with their father who has Alzheimer's. Scott Duncan was diagnosed with the disease in 2012 and has recently been moved to a 24-hour nursing facility due to his deteriorating health. That's why the 23-year-old Grapevine, Texas, siblings took the photos, dressed up in floor-length wedding gowns right on their neighbor's front yard. 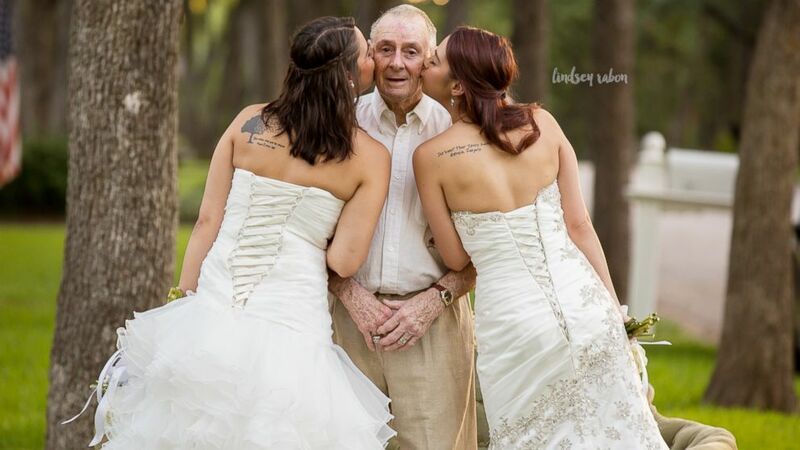 (Lindsey Rabon Photography) Twin sisters Sarah and Becca Duncan took wedding photos with their ailing dad Scott long before they're set to walk down the aisle. "We just randomly thought of this idea," Becca told ABC News. "Me and Sarah know that our dad is more than likely not going to be at our wedding -- it's not being a downer or anything; we’re just being realistic -- so we decided to do these wedding pictures with Dad." The sisters said the 10-minute photo shoot was one to remember, including seeing their father's face when he first saw them in wedding gowns. "The entire experience was the best thing in the world. Seeing him coming down the hall and seeing us in our wedding dresses and him smiling. It meant so much to us," Becca said. Sarah added, "You could see the smile on his face." The sisters' mother Pamela helped the twins secure a photographer, Lindsey Rabon, who later donated the photos. Their mother also helped with their make-up. Thanks to friends and family, the Duncan sisters also received donated wedding gowns and bouquets for their bridal-inspired photo shoot. 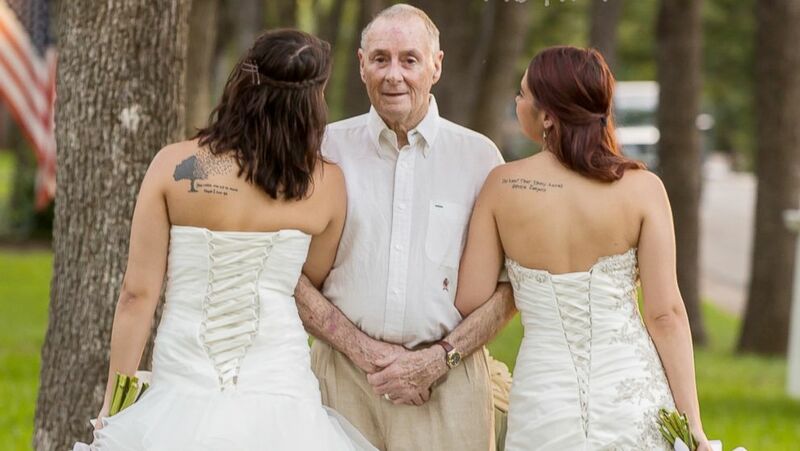 The two sisters, both of whom are in relationships of nearly one year, said they planned for their father, who is an 80-year-old retired businessman, to be a large part of their wedding. "For me, it's all about the daddy-daughter dance," Sarah said, "and having him give away his daughter to a new guy to take care of." Becca agreed, adding, "Every girl dreams about her big wedding and her dad walking her down the aisle. ... It would be awesome to have our dad there. He was our superhero. He was our Superman growing up." And if he isn't, the twin sisters, who both take classes at Tarrant County College in Arlington, Texas, said they'll still have their bridal memories from their impromptu photo shoot. "It's something that we're going to have for the rest of our lives," Becca said.